Oleander (Nerium oleander L.) is native to northern Africa and the eastern Mediterranean basin along watercourses, gravely places and damp ravines (Bailey, 1976). It is a fast-growing tough, versatile evergreen shrub that can reach up to 10 to 15 feet tall but is usually trimmed at 6 to 9 feet to form a rounded shrub. The bright green leaves are leathery, lance shaped, and about 4 to 10 inches long, depending on the cultivar. Showy summertime flowers can be white, red, pink, salmon or light yellow in color and are about 2 inches in diameter, five-petalled with the throat of each flower fringed with long petal-like projections (Bailey, 1976). About 400 cultivars have been named representing a wide variety of flower colors from deep to pale pink, lilac, carmine, purple, salmon, apricot, copper, orange and white (Huxley, 1992). Some cultivars also have white or yellow variegated leaves. 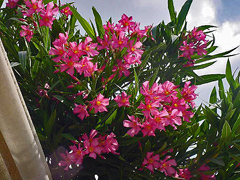 Typically oleanders are used for screens, informal hedges, colorful accents, beach plantings, and cityscapes (Arnold, 2002). By removing suckers, and leaving just a few stems, oleanders can be formed into small trees (Comeaux, 1991). 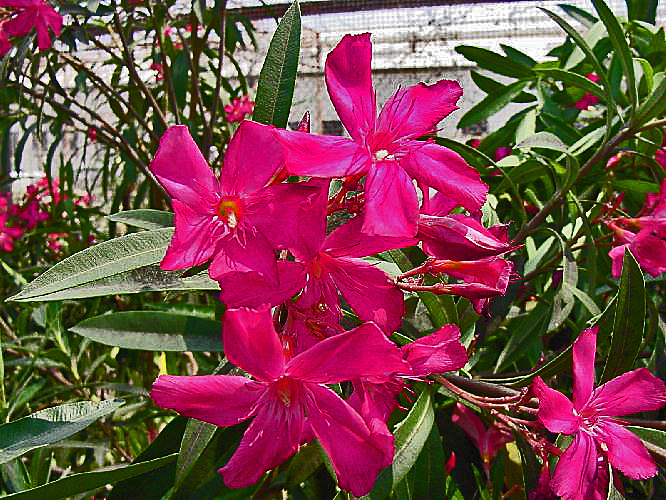 In addition, oleander is suitable for container gardens and is a popular choice for bringing color into greenhouses and conservatories. As such, it has been a favorite container plant in Europe for more than four hundred years (Comeaux, 1991). 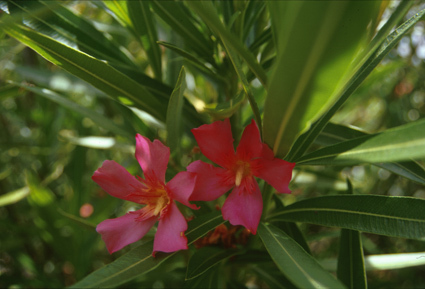 The use of oleander varieties in the landscape is currently limited to warmer parts of the United States, USDA plant hardiness zones 8 to 10 (Arnold, 2002). Even in those zones winter damage can occur as happened in Galveston in 1989 when a severe freeze killed many plants back to the ground. 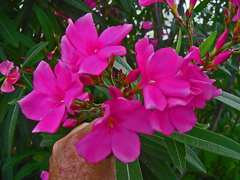 In many communities such as El Paso and Dallas (USDA plant hardiness zone 7b), oleanders are used in the landscape even though regular, periodic losses of plants occur due to winter injury. 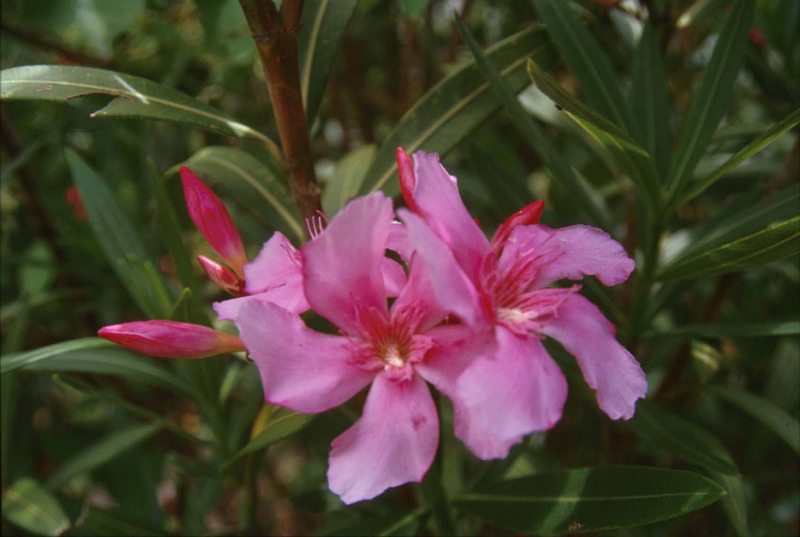 Because oleanders fill a need in the landscape with their heat and drought tolerance, pest resistance, deer resistance, salinity tolerance, and extended blooming period, they are used in spite of their lack of hardiness. New adapted varieties would be a great asset to those communities that have marginal success with the varieties that are currently available. 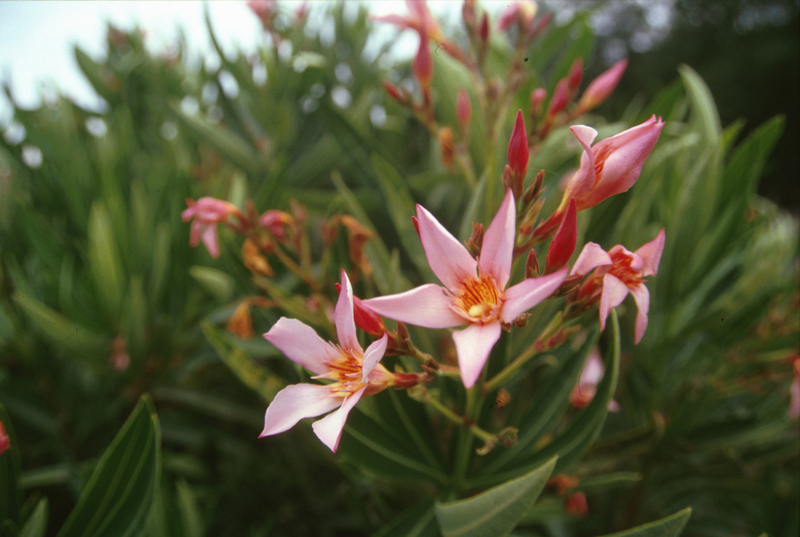 To extend the landscape use of oleanders in Texas, a project to develop cultivars that are tolerant of temperatures to 10 degrees F. was initiated in 1991. Seed from three cultivars that are considered to be more winter hardy, 'Hardy Red', 'Franklin D. Roosevelt' and 'Professor Parlatorre', were provided by "Kewpie" Gaido in 1991 from plants contained in the collection at the International Oleander Society in Galveston, Texas. 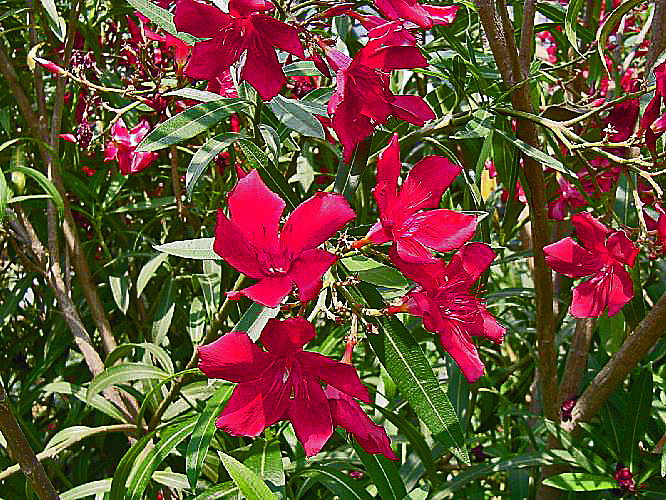 'Hardy Red' is a large class oleander considered to be hardy to 28 degrees F.. Its single bright red flowers are born in large clusters on spikes. 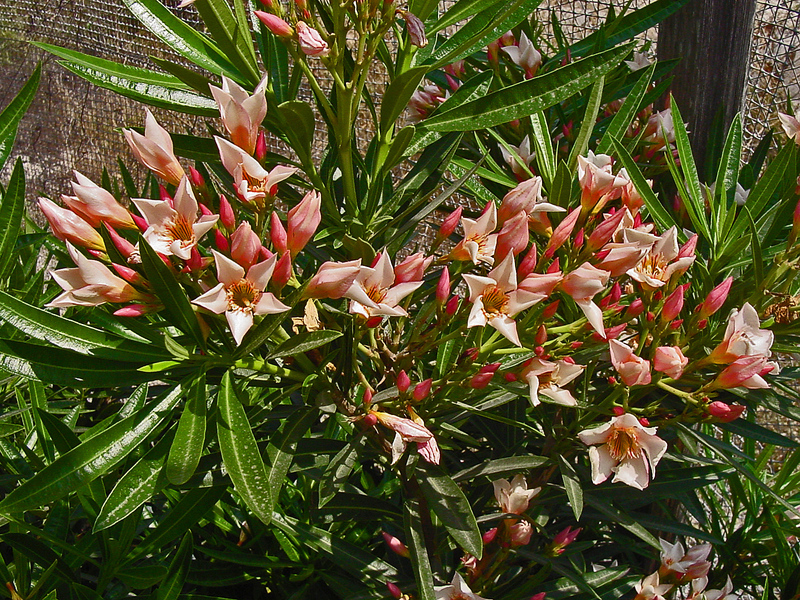 'Franklin D. Roosevelt' is a large class oleander with single, dark-salmon flowers with a yellow-throat on large clustered spikes. 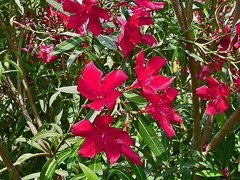 'Professor Parlatorre' is a large class oleander with single medium-cerise flowers with spreading corona teeth on large clustered spikes. All three cultivars are not free blooming and non fragrant. Half-sib seed from uncontrolled pollinations was used to increase genetic variability of the resultant population. Collected seeds were irradiated at four dosage levels (60, 45, 30 and 0 rads) at the Nuclear Science Center at Texas A&M University at College Station and germinated in a commercial greenhouse in San Antonio, Texas. None of the seed irradiated at the highest level (60 rads) germinated, indicating a lethal dosage. At 45 rads, there was variable germination among the populations with no survival of germinated seed from the cultivar Franklin D. Roosevelt. There was uniform seed germination in the 30 rads and control (0 rads) treatments in all three seed sources. In August, 1991, about 1000 seedlings were taken to the Texas A&M Research and Extension Center in El Paso, Texas, and transplanted to containers in the greenhouse for over wintering. In spring 1992, half (431) of the surviving plants were randomly selected from the seedling population and established in a field planting at Texas A&M University, TAES El Paso, Texas for evaluation. The number from each treatment was as follows: 110 'Hardy Red' 45 rads; 49 'Hardy Red' 30 rads; 48 'Hardy Red' 0 rads; 47 'Professor Parlatorre' 45 rads; 46 'Professor Parlatorre' 30 rads; 36 'Professor Parlatorre' 0 rads; 48 'Franklin D. Roosevelt' 30 rads; and 47 'Franklin D. Roosevelt' 0 rads. The remaining plants (431) were established in San Antonio as follows: 126 'Hardy Red' 45 rads; 46 'Hardy Red' 30 rads; 48 'Hardy Red' 0 rads; 47 'Professor Parlatorre' 45 rads; 68 'Professor Parlatorre' 30 rads; 48 'Franklin D. Roosevelt' 30 rads; and 48 'Franklin D. Roosevelt' 0 rads. EI Paso. The field plot at the Texas A&M University, TAES-El Paso is characterized by upland soils, made of Bluepoint loamy sand which has a very high permeability, low water holding capacity and a pH of about 8.4. A micro-spray irrigation system was installed to supply water as needed. Field plots at TAES- EI Paso are in USDA Hardiness Zone 7b, with average minimum winter temperatures of 10 degrees F. to 5 degrees F.. In Winter 1993-94, temperatures dropped to 10 degrees F. and were routinely below 19 degrees F. resulting in damage to approximately half of the plants. In the spring of 1993, 245 plants that had either leaf necrosis or stem and leaf necrosis were removed from the field plots. From 1994 to 1997, a few additional plants were removed due to cold damage. In 1995 and 1997, 10 plants were selected and vegetatively propagated for further evaluation at other locations within Texas. Following selection in 1997, the selected plants were monitored yearly for field performance under conditions of limited irrigation. San Antonio. The plot soil is characterized as a loamy fine sand Hockley soil series with a pH of 7.8 to 8.0. The plants were randomly planted and drip irrigated as needed. The field plots in San Antonio were in USDA Hardiness Zone 8b with average minimum winter temperatures 19 degrees F. to 14 degrees F.. No plants were removed from the plots as no cold damage was observed. Two plants were selected in 1997 for their flowering and growth characteristics for further evaluation at Texas A&M University, TAES-Dallas. Following selection, all plants in San Antonio were destroyed. 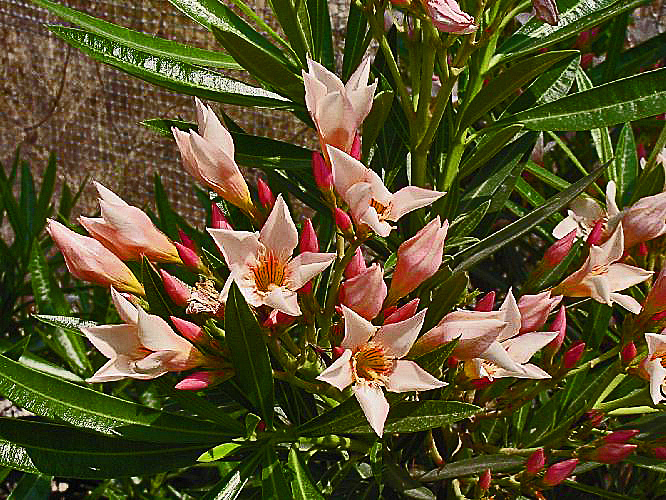 In Fall 1997, six plants of each of the ten selections from El Paso, the two selections from the plantings at San Antonio plus two unnamed control plants from Galveston were established in Texas A&M University, TAES Dallas field plots (USDA Hardiness Zone 7b, average minimum winter temperatures -12 to -15°C). The two unnamed Galveston plants were purported by the International Oleander Society to be the most cold hardy in the collection and were propagated by Dr. Parsons for use as controls in the planting at Dallas. Plants were watered by hand as needed during the first year and no fertilizer was applied. Plants were allowed to grow naturally with no pruning, except for selected plants to obtain cuttings for propagation. Those plants were not used for measurement in the proposed cultivar descriptions below. 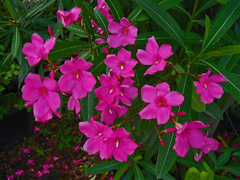 In the spring of 2000, 'Hardy Red' and 'Hardy Pink' plants were added to the plots. In Spring 2001, four plants each of HR45-02-01-91, PP30-12-14-91, 'Hardy Red' and 'Hardy Pink' were established at Texas A&M University, TAES-Lubbock, Texas (USDA Hardiness Zone 7a, average minimum winter temperatures 5 degrees F. to 0 degrees F.), which is one USDA hardiness zone colder than typically associated with landscape use of oleander to further assess their relative winter hardiness. Plants were placed in 4 plots in the landscape surrounding the center (north, east, west and south) to expose the plants to different conditions. The soils are characterized as an Olton loam, a fine-loamy, mixed, superactive, thermic Aridic Paleustalfs, pH of 8.0 to 8.3 with good drainage. The physical measurements and descriptions are outlined in Table I and Fig. 1 in addition to the detailed descriptions that follow. The designation in brackets following the cultivar name is the original breeding line number. Seeds were sown in 1991 and all cultivars are from the TAES-El Paso plots. 'Cranberry Cooler'[HR45-01-09-91]. This cultivar originated from seed of 'Hardy Red' irradiated with 45 rads. 'Cranberry Cooler' has dark pink, cerise to cranberry [red-purple group Royal Horticultural Society (RHS) 61B] petal lobes with darker shadows and edges (red-purple group RHS 61A). Petal lobes that are elongated and slightly floppy in appearance. 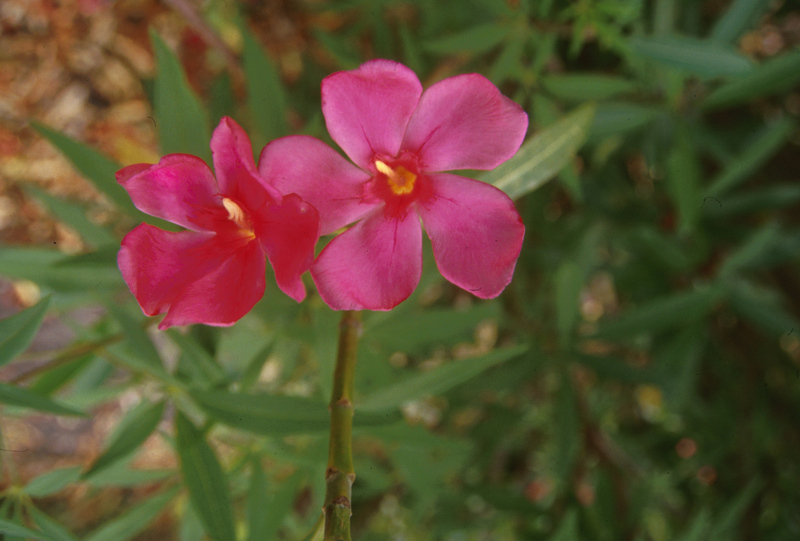 The flower throat is the same dark pink as the petals with a corona that tends to rise above the petals. The corolla tube is lighter than the petal lobes, streaked, and somewhat yellowish at the base. Sepals are short brownish, curling backward. Flowers average 45 mm wide with petal lobe length 48 mm, sepal length 5 mm, and corona length 25 mm. Fully expanded leaves are an average of 24 mm wide and 149 mm long. Average stem internode length of the 5th internode is 17 mm. Average plant a height 7.5 years after planting in TAES-Dallas field plots is 2.7 ± 0.1 m and width is 3.2 ± 0.2 m (n = 5). 'Grenadine Glace'[HR45-02-01-91}. This cultivar also originated from seed of 'Hardy Red' irradiated with 45 rads. 'Grenadine Glace' has dark red petal lobes (red group RHS 46A and 53 A) that have a velvety iridescence that brings out scarlet highlights (red group RHS 53B) and almost black shadows (gray-purple group RHS 187A). The flower throat is the same dark red as the petals varying from intense red to almost black depending on the direction of the light source. The corolla tube is dark red at the top fading to lighter red then to a gold blush dark red. Sepals are brown, flared outward and faint green in the stalk. Flowers average 42 mm wide with petal lobe length 45 mm, sepal length 9 mm, and corona length 28 mm. Fully expanded leaves are an average of 22 mm wide and 158 mm long. Average stem internode length of the 5th internode is 15 mm. Average plant height 7.5 years after planting in TAES-Dallas field plots is 2.3 ± O.1 m and width is 2.8 ± 0.1 m (n = 5). 'Pink Lemonade' [HR45-03-12-91]. This cultivar also originated from seed of 'Hardy Red' irradiated with 45 rad. 'Pink Lemonade' has vibrant hot-pink petal lobes (red-purple group RHS 64D). A sectoral chimera is visible on the underside as a lengthwise band from the base to the upper right edge and darker on the right side (red-purple group RHS 64D). The flower throat is yellow (yellow-orange group RHS 16B). The corona is hot-pink, the same as the petal lobes. The corolla tube is golden yellow (yellow-orange group RHS 16C), rising to where the petal lobes separate, and reddish just above the sepals. Sepals are reddish brown. Flowers average 37 mm wide with petal lobe length 43 mm, sepal length 7 mm, and corona length 20 mm. Fully expanded leaves are an average of 25 mm wide and 197 mm long. Average stem internode length of the 5th internode is 15 mm on flowering stems and 42 mm on vegetative stems. Average plant height 7.5 years after planting in TAES-Dallas field plots is 2.0 ± 0.1 m and width is 3.5 ± 0.1 m (n = 5). 'Peppermint Parfait' [HRO-08-13-91]. This cultivar originated from control seed (0 rad) of 'Hardy Red'. 'Peppermint Parfait' has medium-pink petal lobes (red-purple group RHS 62B to Purple RHS 75B) with a sectoral chimera (red-purple group RHS 68B to 68A) visible on the upper and lower petal lobe surface with the lengthwise band diagonal from the corolla base to the upper right edge. The corolla is a clockwise pinwheel flower type. 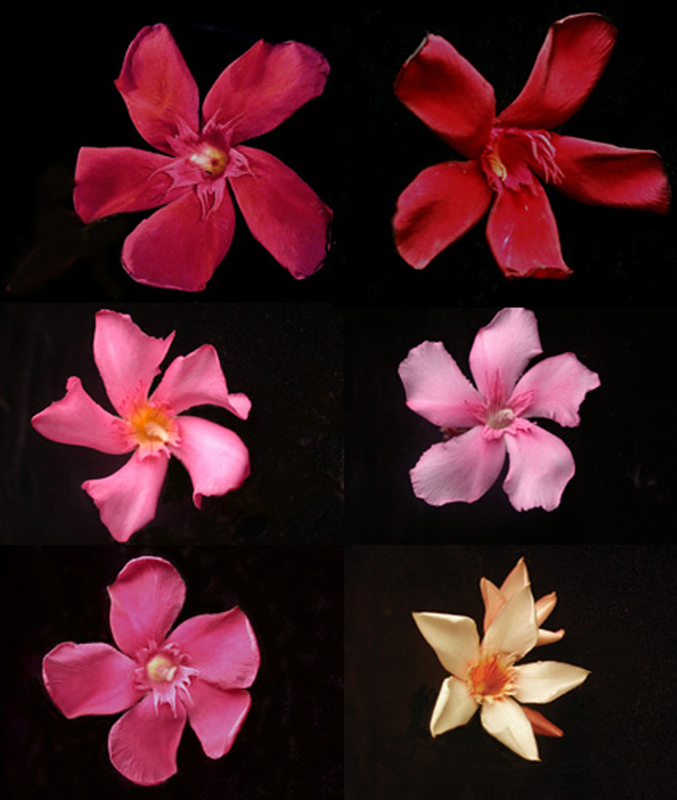 The flower throat is pink matching the deeper shade of the petal lobes with the corona a deeper pink with red lines, one or two completely to the base, the other one or two abbreviated. Stamens are off-white and twisted in a rope. The corolla tube is pale pink with faint streaking, and fading into the deeper pink of the petal lobes, yellow at the base and reddish at the attachment point. Sepals are yellow-green with a reddish blush. Flowers average 42 mm wide with petal lobe length 45 mm, sepal length 9 mm, and corona length 28. Fully expanded leaves are an average of 25 mm wide and 146 mm long. Average stem internode length of the 5th internode is 15 mm. Average plant height 7.5 years after planting in TAES-Dallas field plots is 2.3 ± 0.02 m and width is 2.8 ± 0.1 m (n = 5). 'Raspberry Sherbet' [PPO-14-24-91]. This cultivar originated from control seed (0 rad) of 'Professor Parlatorre'. 'Raspberry Sherbet' has evenly colored deep pink petal lobes (red-purple group RHS 57C to 63B) that form points at the outer edge and are slightly twisted clockwise. The flower throat is deep pink with the crown and corona an intense deep pink (red-purple group RHS 57A). The five stamens are prominent, creamy-white, twisted into a rope. The corolla tube is the same color as the petal lobes except at the base where it is white and then a darker pink at the attachment. Sepals are dark reddish brown, with a red base flaring at the tip. The clusters of spent and abscised flowers give the overall impression of burgundy florets that contrast sharply with the clusters of pink flowers. 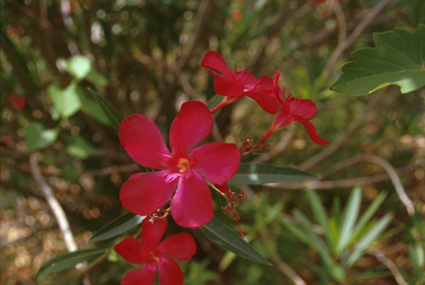 The peduncle is dark red with the stem below the calyx yellow-green, tinged with dark red. Flowers average 48 mm wide with petal lobe length 40 mm, sepal length 5 mm, and corona length 19 mm. Fully expanded leaves are an average of 35 mm wide and 165 mm long. Average stem internode length of the 5th internode is 20 mm on flowering stems. Average plant height 7.5 years after planting in TAES-Dallas field plots is 2.9 ± 0.03 m and width is 3.1 ± 0.2 m (n = 5). 'Petite Peaches and Cream' [PP30-12-14-91]. This cultivar originated from seed of 'Professor Parlatorre' irradiated with 30 rad. 'Petite Peaches and Cream' has creamy-yellow (orange RHS 27B with some RHS 27D) petals with a coral-pink rim on the side where the sectoral chimera is pink (red group RHS 37C), divided from the cream-colored half along a distinct line from tip to the top of the corolla tube. The petal lobes are pointed with the dark pink side curved inward, accentuating the point and in a pinwheel. The corolla throat is creamy-yellow (yellow-orange group RHS 16B) with distinct orange-red streaks (orange-red 33A). The corolla tube is yellow (yellow-orange RHS 16A) with irregular orange-red streaks (orange-red RHS 32A) which gives an overall color effect of orange (orange RHS 26B-26C). The corona is the same color as the petal lobes. Sepals are yellow-green and lack the distinct knobby base of the other plants in the trial. Flowers average 31 mm wide with petal lobe length 40 mm, sepal length 12 mm, and corona length 15 mm. Fully expanded leaves are an average of 24 mm wide and 215 mm long. Average stem internode length of the 5th internode is 8 mm on blooming stems and 10 mm on vegetative stems. Average plant height 7.5 years after planting in TAES-Dallas field plots is 1.4 ± 0.1 m and width is 2.6 ± 0.1m (n=5). TAES- Dallas. With the exception of 'Petite Peaches and Cream,' none of the proposed cultivars suffered winter injury in the TAES Dallas field plots through 2003. In contrast, the two control cultivars from Galveston suffered freeze damage in all years with plants dying back to the ground in the colder years of the trial. 'Hardy Red' and 'Hardy Pink' suffered leaf burn and some shoot dieback in 2001-02 and 2002-03. The lowest minimum winter temperatures from the fall of 1997 to the spring of 2003 were as follows: -6.7° C (1997-98); -8.9° C (1998-99); -5.6° C (1999-2000); -8.9° C (2000-01); 13 degrees F. (2001-02); -9.4° C (2002-03). In 2002, the lowest minimum temperature was recorded in early March (13 degrees F.) and in 2003 the lowest minimum temperature recorded was in late February (-9.4° C). 'Petite Peaches and Cream' suffered leaf burn and minor stem dieback from both late season freezes with the injury similar to that exhibited by 'Hardy Red' and 'Hardy Pink'. TAES-EI Paso. None of the original plants of the proposed cultivars in the TAES-EI Paso field plots exhibited freeze injury during the evaluation period. However, the coldest winter temperatures occurred during the first years of the study. Performance of these cultivars will need to be tested across a wider range of environments to determine performance outside of Texas as differences in winter moisture patterns, amount of time below freezing temperatures, and different patterns of temperature change will all potentially affect the winter performance of the cultivars in other environments. Growth habit. 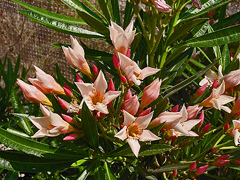 'Petite Peaches and Cream' was originally selected for dwarf growth habit and was evaluated in all locations for growth characteristics. The dwarf growth habit exhibited by 'Petite Peaches and Cream' is a result of shortened internodes compared to the other proposed cultivars (Table 1). The number of leaves formed on 'Petite Peaches and Cream' in a growing season is similar to the other proposed cultivars, but plants are shorter due to the shorter internode length. As such, the leaf density of 'Petite Peaches and Cream' is much higher than the other proposed cultivars and the overall appearance is similar to a plant that has been sheared to increase branching and leaf density. As noted above, 'Petite Peaches and Cream' exhibited similar winter injury as 'Hardy Red' and 'Hardy Pink' but is much smaller in size. Propagation. Plants are readily propagated by softwood or semi-hardwood cuttings in the spring or summer. Pests. Aphids, particularly the yellow oleander aphid (Aphis nerii Boyer de Fonscolornbe), and scales such as oleander scale [Aspidiotus nerii (Bouche)], false oleander scale, [Pseudaulacaspis cockerelli (Cooley)], and oleander pit scale [Asterolecanium pustulans (Cockerrell)] are possible pests but are more likely in humid climates (Gilman and Watson, 1994). 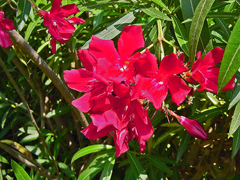 The plants can also be attacked by the oleander caterpillar (Syntomeida epilais Walker) that can defoliate a plant in a matter of days but is not lethal to the plant. Recently the glassy-winged sharpshooter [Homalodisca coagulata (Say)] has been identified as being a vector for bacterial leaf scorch (Xylella fastidiosa) in oleander (Purcell et al., 1999). The symptoms of bacterial leaf scorch resemble drought or salt damage with the eventual death of the plant, usually within two years. Arnold, M.A. 2002. Landscape plants for Texas and environs, p. 775-776. Stipes Pub!. LLC. Bailey, L.H. 1976. Hortus third: A concise dictionary of plants cultivated in the United States and Canada. MacMillan Publ. Co., New York. Comeaux, B. (ed.). 1991. 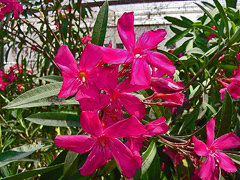 Oleanders: Guide to culture and selected varieties on Galveston Island. Intl. Oleander Soc., Galveston, Texas. Gilman, E.F. and D.G. Watson. 1994. 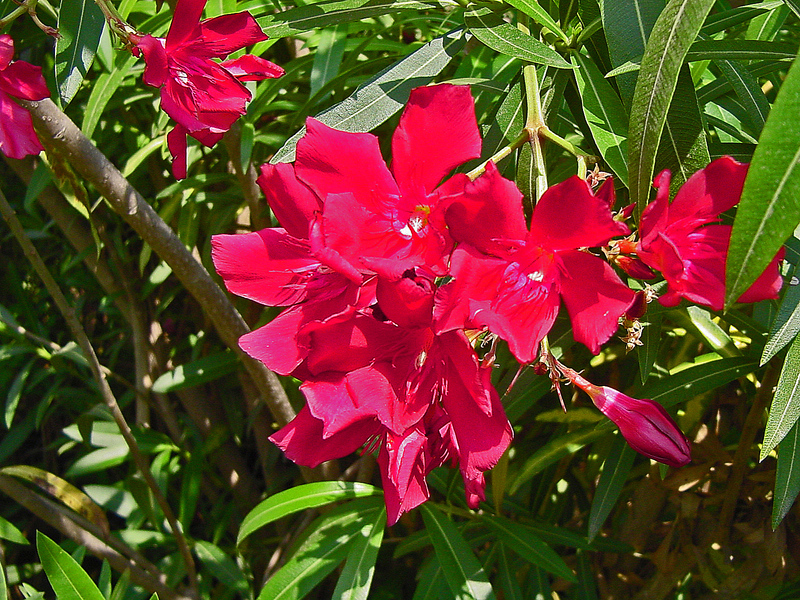 Nerium oleander: Oleander. Fact Sheet ST-412. Univ. Fla. Coop. Ext. Serv. Inst. Food Agr. Sci. Huxley A. (ed.). 1992. The New Horticultural Society Dictionary of Gardening. vol. 3. MacMillan Publi. Co., Inc., London. Purcell, A.H., S.R. Saunders, and M. Hendson. 1999. 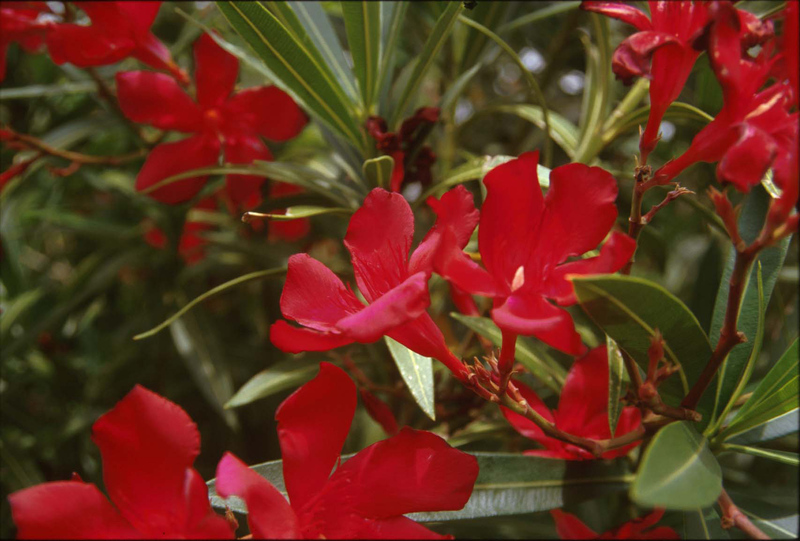 Causal role of Xylella fastidiosa in oleander leaf scorch disease. Phytopathology 89(1):53-58. Royal Horticultural Society. 2001. Royal Horticultural Society colour chart. Royal Hort. Soc., London. Something “NEW” and “SPECIAL” for 2018!!!! These plants are well-rooted and are 20-inches tall, single stems -- you can either step them up into larger containers to see them bloom this spring or take several cuttings from each plant for propagation. These oleanders root easily and should root in the winter with bottom heat. Dr. Parsons delivered the 230 hardy oleander plants on January 25, 2018.